Over the past few years we’ve heard a number of alternative ‘dangerous dog’ solutions proposed. Ways and means by which we can prevent dog attacks from occurring. Ideas and suggestions which can help us rid ourselves of the menace of dog attacks. One of the most common ideas put forward seems, on the face of it, to be entirely sensible: to muzzle all dogs and keep them confined to a lead at all times in public. Well, whilst it may seem sensible – unfortunately, it is not. In fact I speculate that if we want to literally DOUBLE the number of dog attacks, especially the most serious ones, the way to do it would be to muzzle and confine all dogs to leads in public. I shall hereby try and explain the flaws in this ideology. 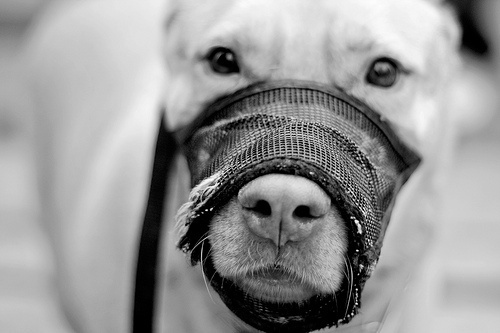 Continue reading Should We Muzzle ALL Dogs In Public? Posted on June 6, 2014 June 6, 2014 Author adminCategories DogsTags dog control laws, dog discussions190 Comments on Should We Muzzle ALL Dogs In Public?